With over 100 websites to our credits, we’ve designed, built, and managed every kind of site. Here are some samples. Done together, they can provide incredibly powerful marketing. Find out exactly why, and how you can benefit. Got 60 seconds? Watch this video to find out what we’re all about, and why we’re uniquely qualified to help you. Like many young musicians, I dreamed of being a rock star. I studied music at UCSB (University of California at Santa Barbara), played in a number of bands, and taught guitar for many years. It was a great deal of fun: I played a lot of shows, traveled quite a bit, and (in what is a common story), was in a band that was on the way to signing a deal with A&M records. Unfortunately, one day that the A&M rep called me to say he wanted the band to come in for a meeting, I had to inform him that we had broken up. Oh, the humanity! Soon after that, I was hired by Fender (yes, the world-famous guitar company) as an Advertising Copywriter. It was a job that was to change my life. 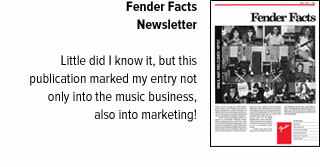 Producing their catalogs, owner manuals, and other materials was cool, but what really got me pumped was putting together their newsletter: Fender Facts. Doing that publication, I worked with Columbia Pictures and Macey Lipman Marketing on the promotion of the movie La Bamba, among other things. Besides writing them up in the newsletter, I was integral in getting product placed in the movie. After doing a few issues of Fender Facts, the powers that be at Fender agreed that there was so much to talk about, I should do a magazine. That’s how Fender Frontline was born. 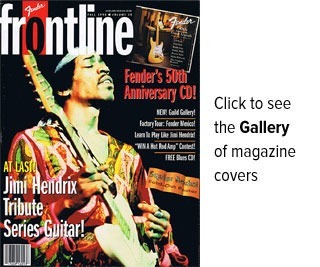 So I became the editor of Frontline, as well as a Publicity Manager for Fender. Several years into my stint with the magazine, Fender moved to Arizona. They installed me at their advertising agency in Los Angeles, to continue producing Frontline. Eventually, I became the liaison between Fender and the agency, as well. I picked up a lot about marketing from some pretty experienced people. Being at the agency also inspired me to learn more about publishing, and I decided to sell ad space in Frontline. It wasn’t easy! But I persisted, and over time Elektra, A&M, Silvertone and other labels bought advertising, further broadening my contact with the record companies — as well as my marketing skills. 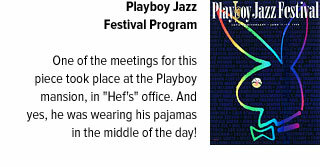 Through the magazine I got to know the president of a company in the music industry. As he was knowledgeable about recording, I asked him to write a column for the magazine. During one of our photo shoots, he mentioned that he needed a Web site. I volunteered, and my new business was born — a business I’ve been in for more than 18 years. My varied background in music and related entertainment industries, sales, and publishing, gives me a unique edge when marketing my clients’ products and services online. The elements of magazine layout (clarity, readability, getting viewers to focus on specific details, etc. ), gave me a good foundation for Web design. And though my connections often lead entertainment-related companies to seek my expertise, the techniques I have developed work just as well for other industries. The list of my clients includes numerous retailers, doctors, dentists, attorneys, several independent films, a recording studio, personal trainers, insurance agents, restaurants, bands, schools, contractors, charitable foundations, musicians, songwriters, accountants, musical instrument manufacturers, television production companies, and many others. Although work keeps me pretty busy, I still find time to play in my band, Savor: A Tribute to Santana. You can see our video. We average about 20 dates a year, and have played at fairs and festivals all over southern California, Arizona, and Nevada, as well as a number of casinos. 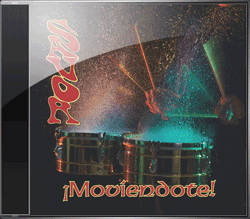 Our CD of original Latin rock music is available on Amazon and CD Baby. Before, that I was in a band called Hook. So I guess I’ve come full circle: much as I tried to escape it, once a musician, always a musician! © Copyright 1995 - 2019 Responsive Websites, SEO, PPC | Caroff Communications. All Rights Reserved.